IT8500+ series (150W~3000W) single-channel programmable DC electronic loads are designed for middle &high-end applications.They can be offered as multiple solutions according to customer's design and testing requirements.The user can perform online voltage measurements and adjustments or simulate short circuit test using the simple keypad on the front panel. IT8500+ series DC loads are a versatile instrument for static and dynamic testing of power supplies, batteries,DC - DC converters,battery chargers,provides user the best testing solution. The dynamic test operation allows the electronic load to be switched between the two setting parameters according to the setting rules. This function is used to test the dynamic characteristics of the power supply. ♦ Continuous mode: Under continuous mode, When the dynamic test operation is enabled, load will be continuously switched between the A value and the B value . ♦ Pulse mode: Under pulse mode, when the dynamic test operation is enabled, each receive a trigger signal, the load will switch to the B value, after maintaining the B pulse width time, switch back to the A value. ♦ Toggled mode: In the trigger mode, when the dynamic test operation is enabled, each time a trigger signal is received, the load is switched between the A value and the B value. IT8500 + series electronic load can use constant current mode for battery discharge test. After the discharge test mode is selected, the test mode termination condition "switch off voltage value", "switch off capacity value" and "discharge time" can be set. When any of the three conditions is satisfied, the discharge is stopped and the electronic load is automatically switched is OFF state. 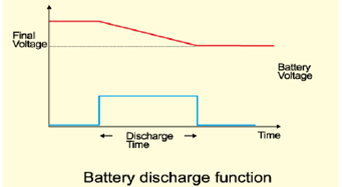 Users can observe the battery voltage, time and battery discharge capacity during the test process.